3. 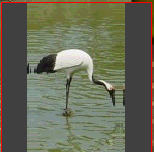 The image is calculated on the assumption that the observer is far away from the lens and the background picture is put under and close to the lens. 4. This applet is written in full accord with Snell's law of refraction. The image obtained is perfectly identical to the real one. Click here to see a comparsion of them. 5. If either the ratio h/R or the index of refraction, n,is too large, opague region(s) may appear at the edge of the lens. Indeed, this phenomenon is very common. Stand a transparent semi-circular block upright with its curved surface downwards. When viewed from the top, the two ends of the upper flat surface will not show any images of the bottom paper. Practically, this can serve as an easy method of finding the index of refraction of the block. 6. Use the mouse to drag the lens to move; right click inside the lens to see the background without magnification.